Devon's best value car body repair centre; T&T Coachworks are a family run business and have been established in the Devon area since 1989. 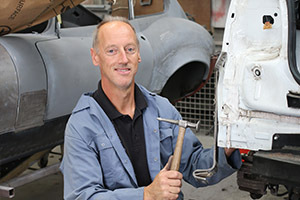 Founder, Tony Pulman has many years of experience in car panel work and respraying industry while his wife, Nikki works in the office and son, Matt is a qualified panel beater. With a fully qualified team consisting of 5 panel beaters, 2 spray painters and 1 current apprentice, the entire T&T Coachworks team have all been internally trained in-house. This means that the level of work is at a very high standard and between us we are are fully equipped to repair everything from a small dent to major accident damage. "We carry out body repairs for all types of cars and light vans. Whether it is small smart repairs or major accident repair, give us a call on 01404 850067 for a free, no obligation quote"
We can save you money by repairing as opposed to replacing. From scratches to crash repairs, we are your one-stop. We are often able to remove and repair dents from your vehicle be it large or small, returning your bodywork to its original form. Scratches and stone chips can remove the protective layer of paint from your body work. 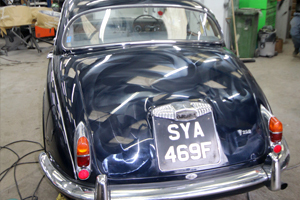 We can restore your car.